When Shane came back from his trip to Detroit, he brought home a box of pastries from the Shatila Bakery and Cafe. Now, I’ll be honest, the type of Middle Eastern and Mediterranean desserts they make –“tissue-thin pastry swabbed with rich, pure butter, enfolds crunchy fresh nuts and a sweet sugar syrup” — really aren’t my thing. Having said that, even I can tell that these are really good. Light, flakey, crunchy with plenty of butter, the Shatila folks are not skimping on quality. 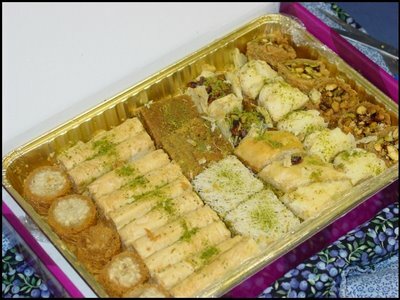 Take a look (and place an order) on their website: Shatila Bakery and Cafe. I echo what Lis said. The 18th & 19th Centuries? Wow, talk about your retro food. Don’t tempt me; I received this as a present, so I’ve toyed with the idea of a way retro food challenge.An excerpt from said book (note the spellings):Lemon Ice Cream: The Juice of fix Lemons to two Quarts Water (or two Cups bottled Juice). Steep the Peels for fometime in the Water (or fome Lemon Conferve if you have not frefh Peels ) and ftrain it. Mix into it two Pounds white Sugar and the Whites of twenty-four Eggs beat till they will adhere to the Bowl. The Freezer muft be kept in Motion till yr Cream is of the Confiftence of Snow.” — Manufcript Cook Book, c-1801, of Mrs Frances Bland Tucker Coalter. Owned by St. George Tucker Grinnan, Richmond. I know, I know. I just think those Colonial recipes are so interesting. They illustrate more than just what these people ate: they show what they had to know (and didn’t know), how they spoke, and how and what they thought.Check out this excerpt from the Turtle Soup recipe:”Turtle Soup: Kill the turtle at Daylight in Summer, the night before in Winter, and hang it up to bleed.”As this is the “Accomplish’d Gentlewoman’s Companion” cookbook, does that mean that the gentlewoman herself is going out, catching a turtle, killing it and “hanging it up to bleed?” That seems to run counter to my knowledge of gender roles for that period but what do I really know? Maybe that was part and parcel of the housewife’s job: bear the children, clean the house, kill the turtle. Are we sure that Mrs Frances Bland Tucker Coalter just didn’t have a lithp? Personally, I’m glad they did away the love apple:”[An Elizabethan} woman would put a peeled apple under her arm for a while and offer the ‘love apple’ to her beloved as a gift.” Source.I’m not sure if the lover was supposed to sniff the apple — or eat it.